A leading University of Ulster academic with an international reputation for his pioneering research in behaviour analysis has highlighted the need for greater support for parents and carers of autistic children. An estimated 1 in 100 people may be on the Autistic Spectrum and Autism can have devastating consequences on the family. Effective intervention can help children with Autism achieve greater independence and alleviate the stress on parents and carers, including siblings. However, although Applied Behaviour Analysis (ABA) has been consistently shown to be the most effective intervention for Autism, ABA is not easily available in Northern Ireland. Professor Mickey Keenan and Dr Stephen Gallagher at the University’s School of Psychology have been making ground-breaking contributions to helping families living with Autism. Their most recent achievement is in the coordination of the STAMPP project (Science and the Treatment of Autism: a Multimedia Package for Parents and ProfessionalsSTAMPPP), funded by the EUfunded Leonardo’s Lifelong LearningProgramme. This innovative project has led to the development of a multi-lingual online resource called Simple Steps. The parent support package was originally developed by Parents’ Education as Autism Therapists (PEAT), the Northern Ireland Autism charity founded by Professor Keenan in 1997. Due to the demand for the package in other regions of Europe, and with funding from Leonardo, the package has now been translated into Norwegian, Icelandic, Dutch, Italian, German, Swedish and Spanish. This innovative online resource will help parents and professionals throughout the World to learn about Autism and ABA. Professor Mickey Keenan, who is a member of the Behaviour Neuroscience Research Group at Ulster’s Psychology Research Institute, has called for parents to be offered education in the science of behaviour as a means of support when they first receive the diagnosis of autism. The Coleraine based academic has been involved in the fight for science-based practice for childrenand their familiesaffected by autism and is well known for his public advocacy in the media and academia for autistic children and their parents. 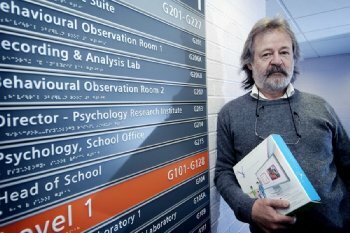 “Parents using Applied Behaviour Analysis (ABA) programmes recorded teaching sessions with their children to create the resource,” explained Professor Keenan. Professor Keenan, who is a Fellow of the British Psychological Society continued:“There has been a significant increase in the prevalence of Autism Spectrum Disorder worldwide and some studies have found that as many as 12 in every 1,000 children in Europe may have the disorder. He continued: “Applied Behaviour Analysis (ABA) has consistently emerged as the most appropriate and effective treatment to help children with autism. There is a big movement in Applied Behaviour Analysis (ABA) studies internationally, especially in the US and Canada but in Europe there is a shortage of behaviour scientists. “Simple Steps uses a variety of multimedia techniques to make the science come alive. This gives parents a head start in understanding and exploiting the benefits of ABA. Through it, parents are being taught how to educate their children, and doing it with the backing of the science. Speaking at the launch of STAMPPP II in Belfast, which was attended by representatives of partner organisations from England, Italy, Iceland, Sweden, Netherlands, Germany, Spain and Norway, Professor Keenan said that even though Simple Steps is widely recognised internationally, it is not still getting the recognition it deserves in Northern Ireland. “Simple Steps has been translated into other languages: our expertise is being exported and parents in other countries have an opportunity to learn about ABA in their own language. “Parents are the foot soldiers but unfortunately in Northern Ireland they are not getting the support they need. This project aims to address this. “Not so long ago, parents in our community were offered bereavement counselling after receiving the diagnosis of autism. I would like to see that offer being replaced with a totally different offer. An offer based on hope, not blind hope,but one anchored in science. I would like to see parents being offered education in a science of behaviour when they first receive the diagnosis of autism. PEATchairman and parent, Professor Tony Byrne, agreed that families living with Autistic Spectrum Disorder (ASD) in Northern Ireland need much greater support. “PEAT provides training and support in ABA to parents and carers of children with autism. ABA is a proven child-centred approach designed to help children and young people with autism realise their potential. Professor Byrne said the statutory authorities are not doing enough to make ABA available in Northern Ireland. Not only does effective intervention help the children and their families, but there are substantial savings that could be made. He added: “According to a LSE (London School of Economics) report last year, it is conservatively estimated that the lifetime cost for someone with autism and intellectual disability is £1.5 million. For someone with autism but without ID it is about £900,000. The overall UK cost of autism is estimated to be about £34 billion each year so there is a strong economic case for effective intervention. If families living with Autism are given appropriate support, the cost to the public purse could be substantially reduced. We need to invest for early effective intervention for Autism.